» Contest Promotions Signs: Helping Mom & Pop Stores, Or Creating Illegal Blight? Contest Promotions Signs: Helping Mom & Pop Stores, Or Creating Illegal Blight? Going to a laundromat to buy cottage cheese or sour cream isn’t something most people would think of doing, and in fact those products aren’t for sale in the laundromat pictured above. Nevertheless, the sign on the side of the building advertising Knudsen dairy products is permitted as an on-site sign, defined by city code as one directing attention to a product or service offered on the premises. The signs are put up by a company called Contest Promotions, which is associated with National Promotions and Advertising, one of whose owners, Gary Shafner, was profiled in last week’s LA Weekly article by Christine Pelisek entitled, “The Mad Men of Los Angeles.” Attached to the frame of the sign is a small placard with the words, “Win these posters and other related prizes here, details inside.” It should probably come as no surprise that none of the posters or any details about prizes could be found amidst the washers and dryers and mounds of dirty laundry. Mounted to the wall of a liquor store just down the street is another Contest Promotions sign, advertising the Knudsen dairy products and the new movie, “Chloe”, starring Liam Neeson and Julianne Moore. Inside the liquor store was a small stack of free posters for the movie “Repo Men” and a music concert that took place in Hollywood two weeks earlier. 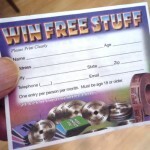 There was also a small box and slips to fill out for a “Win Free Stuff” drawing. The “free stuff” wasn’t specified. According to the Contest Promotions website, the company helps “Mom and Pop” retailers compete against chain stores by increasing foot traffic and bolstering sales. However, while many of the signs are on businesses like liquor stores, donut shops, and mini-markets, they are also found on places like small office buildings, auto repair shops, and other laundromats, where it seems unlikely that people would be drawn in by the offer of free posters and a drawing for unknown prizes. As mentioned in the L.A. Weekly article, Contest Promotions operates in other cities, including New York and San Francisco, which was sued by the company last year after inspectors cited dozens of the signs for violating the city’s ban on any new off-site advertising. The lawsuit, in U.S. District Court, alleges that the signs qualify as on-site signs and that the citations violate the company’s constitutional rights. all advertising helps the economy. yes, some may be unsightly, but we don’t live in the hills, we live in Los Angeles, an urban area. any sign that is taken down takes money out of the shopowners pocket. has anyone asked the question why we’ve seen so many more ads in the last few years everywhere? shop owners and building owners are suffering economically and might be making ends meet with advertising. we could be forcing people into the streets by making them take them down.